The Red Bull New York team is in Mexico for their preseason, sponsored by Yucatan Holidays. The MLS soccer team has been training for a few days in the Riviera Maya and according to some players, the climate has been challenging but definitely enjoyable, compared to the low temperatures and snow blizzards affecting their hometown. Rafa Márquez, Thierry Henry, John Rooney, Conor Chinn and the rest of the team have been training at the Barceló resort and on the beach of Hacienda Tres Ríos resort where they are also staying. 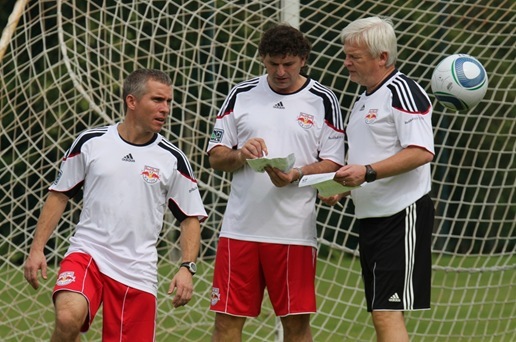 The “Red Bulls” are getting ready for tomorrow’s match against Cancun’s soccer team, Atlante FC. Please follow Yucatan Holidays on Facebook and Twitter for updates, photos and to join the sweepstakes to win tickets for a New York Red Bull match in NYC!